Charleston International Airport (CHS) is both civil and military airport, situated in North Charleston, South Carolina. 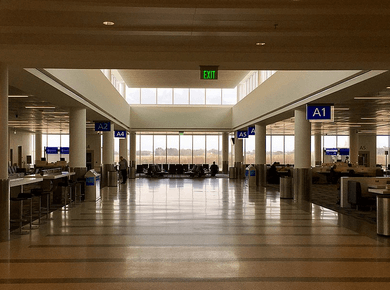 This airport is the busiest and largest airport in whole South Carolina. Charleston executive airport manages to serve just under 4 million passengers every year. The airport consists of four general areas: military area, airline terminal, general aviation area, and Boeing assembly; as this airport is home to the Boeing facility. There is only one Terminal with 2 departing concourses: A to the east and B to the west. Arrivals and departures are situated on the same floor for most efficient use. Atlanta, Charlotte, NY-JFK, Washington-National, Baltimore, Chicago–O’Hare, Newark, Dallas, Philadelphia and Washington-Dulles are the top 10 most popular CHS routes. Charleston International airport parking offers a great variety of parking lots, so you can find the best spot just for you. There is a Free Cell Phone Lot that represents a 30-minute-long parking with no charge taken, for those who just want to deliver a passenger or wait for the arrivals. But be aware that this area does not allow unattended vehicles. The short-term Parking Desk is situated just across the Terminal in a sheltered Parking Garage. The long term parking includes Surface Parking and Remote Parking. The Surface Parking offers great amount of outdoor parking spaces; it is located just behind the Parking Garage. Remote Parking is situated on the airport circle road and border to the Surface Parking lot. Free shuttle services are available 24/7 to and from the terminal. There is also a Valet Parking which is operated by AirValet. It is situated just in front of the Main Terminal, which makes it the closest parking lot available at the airport. Parking Deck costs $1 per each 20 minutes and $15 per 24 hours. Surface Lot costs $1 per each 20 minutes and $10 per 24 hours. Remote Parking costs $10 per 24 hours. Valet Parking costs $21 per 24 hours. There is also a special Handicap parking available. This CHS parking lot provides a 2 days free parking place but only for qualified parking patrons. To be qualified as such, you need to confer a current handicap placard and driver's license to the cashier when you are ready to exit. The license owner must be in the car personally by the time of exit.